Released in 1999, Angel Eyes helmer Luis Mandoki’s Message in a Bottle may have been the first big screen adaptation of a Nicholas Sparks novel but fifteen years later, it still ranks among the very best. And while its success owes a great deal to the first rate ensemble cast including Kevin Costner, Paul Newman and Robin Wright, one can’t say enough about the immense behind-the-scenes talent that was firing on all cylinders in every single department. In fact, watching it again nearly fifteen years since I first saw Bottle at the theater, I realized that the film’s most unsung but nonetheless valuable player is none other than cinematographer Caleb Deschanel whose lush magic hour photography of the Atlantic ocean serves as another character in the movie. The equivalent of visual poetry, Deschanel’s Bottle imagery stands alongside his career best work on films like The Right Stuff and Being There. Par for the author’s course, it’s an absolute heartbreaker of a tale as Message found Sparks drawing inspiration from his own widower father who withdrew into himself and became a veritable recluse following the sudden tragic death of his wife. 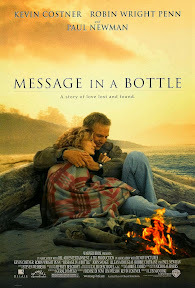 Building ever-so-slowly towards the gut-wrenching coda, the movie opens with an intriguing hook as Wright’s Chicago Tribune researcher Theresa comes across the titular message in a bottle while running on the beach. Using her skills to track down the author of the gorgeously penned letter about love, regret, confessions and recollections of the life he’d shared with his late wife Catherine, Theresa ventures to North Carolina to locate the man in the flesh, only to discover Garret Blake is as attractive as his seductive words (embodied as he is by Kevin Costner in his prime). Falling head over heels for the shy widower and sailboat craftsman who’s no longer “good with people” as he confesses, Theresa is stunned to find her own feelings reciprocated by Garret’s over the course of the film. Not wanting to jeopardize their brand new relationship, Theresa refrains from telling the man what first brought her into his life, which eventually leads to a protracted and predictable confrontation late into the movie that (per the early Sparks formula) ultimately results in a devastating comeuppance or cruel twist of fate, depending on your point-of-view. While, given the way it seems to imply that a character shouldn’t dare to love again, the end is the film’s only real dissonant note in an otherwise lovely romantic composition, fortunately the rest of the film is beautiful to behold. Played with the utmost sensitivity by the leads and handled with far more sophistication than the made-for-cable women’s weepie formula to which some critics feared it would adhere, while Message In a Bottle is a contemporary romance, its laid-back, organic approach makes it feel like a throwback to romances of the ‘60s and ‘70s including A Man and a Woman and Love Story. Admirable for the way it defines its characters as more than just walking and talking plot points waiting to happen, Bottle raises questions and inspires some honest (and difficult) conversations along the way, which is something you seldom find in traditional mainstream romantic fare. For better or worse as you’ll see throughout this box set review, Bottle set up the filmic formula for Sparks adaptations to come. And although Tinsletown would take a step backwards with their next presentation, the most recent succession of Sparks’ films from Dear John onward have thankfully harked back to this classy picture that started it all. As warm in spirit as the raggedy old sweater perpetually worn by the reverend’s shy, sweet-natured daughter Jamie Sullivan (Mandy Moore) in Adam Shankman’s modern day adaptation of Nicholas Sparks’s wholesome novel originally set in 1958, A Walk to Remember is an ambitious reimaging of one of the author’s most personal works. Inspired by the life and death of his beloved sister (and the only one of his novels that Sparks confessed made him cry while bring it to written life), Shankman’s thoughtfully made but overall uneven update loses the old-fashioned tenderness of the novel in its translation from a past to present day setting. From the near start-to-finish pop music soundtrack that interferes with the natural flow of the story by punctuating far too many moments with an MTV style collage of Top 40 hits rather than allowing us to react to the events on a more humanistic level to the awkward romantic chemistry between Moore and Shane West, this is one of the weakest links in the boxed set. And although the charismatic rebel played by West was an early predictor of the great talent he would become on TV and film, unfortunately he just doesn’t click that convincingly with the likable yet relatively inexperienced singer turned actor Moore who (much like West) would also evolve into a far more compelling performer with time. Likewise, it’s further hindered by a weak screenplay that reminds viewers of a cross between a Christian version of Love Story and Pollyanna as the film takes its predictably depressing Sparksian turn. And as we uncover the devastating truth about one of our characters only for them to remain as sunny as ever, the sweet yet naïve Walk starts to ring a bit false for those who’ve experienced anything similar. Well-intentioned yet underwhelming, although it’s sure to play better to teen viewers who can’t relate to the older characters in some of the other Sparks adaptations, everyone else should stick to the movie that they see in their head when they read the novel, which in my eyes unfolded like a teenage Douglas Sirk film in the same vein and color scheme of The Magnificent Obsession. 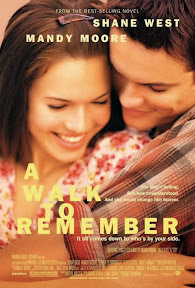 Whereas the onscreen chemistry between Shane West and Mandy Moore in A Walk to Remember barely generated so much as a spark, the palpable sexual tension and fireworks that go off between Ryan Gosling and Rachel McAdams in the long-awaited adaptation of Sparks’s smash successful debut novel nearly generate an onscreen four alarm fire whenever the two share a scene. And although the paparazzi were all too happy to document the fact that there was a burgeoning relationship between the two that blossomed into love offscreen, the reason their chemistry sizzled so well was thanks to brilliant planning by filmmaker Nicholas Cassavetes, who opted to shoot the film out-of-sequence for practical continuity purposes regarding Ryan Gosling’s beard and weight fluctuations. Cassavetes' practical scheduling decision wound up benefiting his movie all the more. By first shooting the reunion of the former teenage sweethearts who had shared a lovesick summer seven years earlier, we see the awkwardness and hesitation the two would’ve had as professionals unfamiliar with one another and the way it makes their scenes coming face-to-face nearly a decade later that much more realistic. Not knowing how to act around one another translated well to not knowing how to act around one another and vice versa when they went back in time afterward and shot the beginning of their love affair afterward. Because Gosling and McAdams had gotten all of the awkwardness with one another out of the way, it made their relationship all the more organic onscreen as they play off each other as lovers so much better thanks to that early foundation portraying reunited strangers. One of those ‘90s pop culture touchstones like Bridges of Madison County and The Firm that likewise dominated the bestseller charts, The Notebook, which was inspired by the relationship of Sparks’s wife’s beloved grandparents, is at its best when it focuses on the extended flashback sequences of Gosling’s Noah and McAdams’s Allie, as narrated by James Garner’s elderly nursing home resident who’s reading the tale to Gena Rowlands. 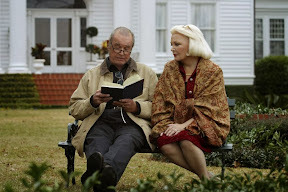 And while it ultimately celebrates the power of true love and the way that it can defy anything, the undeniably depressing bookended contemporary sequences as Garner tries to jog Rowlands’ memory with the story in order to prevent her from succumbing to dementia even for a few minutes ultimately makes The Notebook far too somber when viewed as a film versus a book. Honestly, for readers, the ability to put things into perspective, let them live in your mind and color between the lines of the moving yet downbeat romance helps you get through the storyline that much easier. 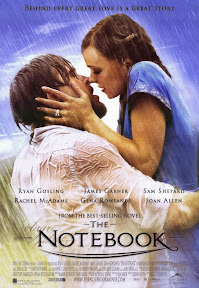 An intriguing cinematic mix, 2004’s The Notebook at last captures the old-fashioned WWII era spirit of the author. At the same time it also pays homage to the director’s influential independent filmmaker father – John Cassavetes and mother Gena Rowlands as well – given some of the manic energy on display in Noah and Allie’s fights that echo some of Cassavetes Sr.’s movies of the late ‘60s and early ‘70s. While much like Sparks, Cassavetes’s heart is in the right place and the luscious cinematography, picture perfect art direction and sound bring everything vivaciously to life, it’s still a damn hard movie to watch, particularly for baby boomers and those whose parents are beginning to face a decline as it’s destined to hit viewers hard. Although I think it would’ve worked even better without the overwhelmingly heartbreaking ending which in addition to depressing viewers likewise goes against everything the film had previously shown and told us about Rowlands’s dementia (by giving her sudden clarity), it’s nonetheless a gorgeous production and exploration of what it means to love someone for life. And despite the fact that I wished the film would’ve known where to stop the action to better honor the way the characters lived their life rather than the way it ended, the film is well-worth tracking down. Yet more than the heart-tugging finale which has become a Sparks trademark, the legacy of Cassavetes’ Notebook has only grown more popular with time. And while you can’t discount the novel, Cassavetes's work can likewise not be overlooked as the title’s popularity owes a great deal to the film as well as the undeniable chemistry between the two young leads that generate a number of sparks in this adaptation of Sparks’ debut Notebook. In her finest performance since her Academy nominated turn in Unfaithful (also opposite Rodanthe’s Richard Gere), Diane Lane plays the struggling mother Adrienne Willis. Still reeling from her beloved father’s death and a separation from her unfaithful husband Jack (Christopher Meloni) who had an affair with someone in her carpool, she packs her kids including her Harry Potter clone son Danny (Charlie Tahan) and rebellious goth girl Amanda (Mae Whitman) off to Orlando with her ex. Wanting an escape – even one that comes with a fair warning that hurricanes are in the forecast, Adrienne returns to the Outer Banks coastal town of Rodanthe, North Carolina to care for the inn of her friend, Jean (Viola Davis). 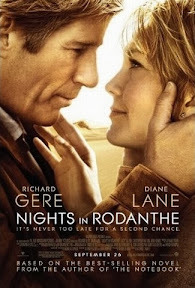 Adrienne’s hurried preparations to leave her troubled, chaotic life behind her are interspersed with the same actions by the only guest paid up for four days in Rodanthe, Dr. Paul Flanner (Richard Gere) who, having sold his home, throws a duffel bag filled with Spanish/English medical texts into his sports car and drives off to Rodanthe to deal with a tragedy of his own. Exquisitely photographed, the picturesque setting of Rodanthe is a character in its own right and none more so than the beautiful clapboard and blue shutter old inn by the sea, where rumor has it in the form of an old pirate legend, wild horses every so often can be seen running free on the sandy beach. Gee, do you think we're going to see any? While it’s awkward at first as Adrienne cooks, cleans and tends to her one guest, Paul breaks the ice on the first night by carrying his dinner into the kitchen to mingle with the lovely stranger over wine, Dinah Washington, and stories of their heartache. The chemistry between Gere and Lane is phenomenal and it’s more than obvious to even the most casual viewer who was unfamiliar with the two or their shared history working together, how comfortable they are in each other’s company. Yet, this is both a plus and a minus in Rodanthe. For starters, they bond much too quickly and rather unnaturally as Adrienne begins unloading all of her baggage right from the get-go in a way that would send most men running. And despite the power of wine, mood music, evening l’amour, and the right lighting, they click far too easily, seeming like old lovers rather than new tentative ones. And it's possibly because of this unconvincing dynamic that Gere never fully settles into his role – maybe feeling as though (even subconsciously) Rodanthe is a cinematic extension of their other work together and they’re just finishing a conversation begun in earlier movies. However, enough cannot be said in favor of Lane who turns Sparks’ overly sentimental moments (and some extraordinarily tacky dialogue) into the stuff of Shakespeare. And this is best on display near the end of the film in a scene following a conversation with James Franco when she not only tears up (along with the rest of the audience for the ten millionth time) but tears into that crying jag authentically in a way that makes us feel not just guilty for watching but wishing we were there to comfort her in her obvious pain. That, my friends, is an actress, and Lane just keeps getting better and better with each passing year, despite the fact that her roles are getting fewer and far more predictable, in the unfair and ageist Hollywood system. While the film could’ve benefited from sharper editing as it feels much, much, much longer than its ninety-seven minutes and you’ll need to come armed with Kleenex, cinematically it’s one of the better Sparks adaptations, and the reason is purely Lane. Although, as great as she is at making us cry, it would be far more pleasurable to once see her laugh. Nicholas Sparks are you listening? Or more importantly is your keyboard? 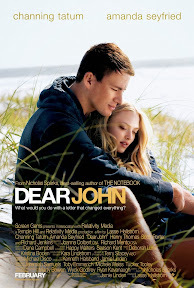 Perhaps the most successful adaptation of his work since the underrated, heart-wrenching Message in a Bottle, Dear John works better than some of the rest since like Bottle, it's chock full of interesting subplots that strengthen the romantic main plot. With a strained relationship with his reclusive coin-collecting father (a superb Richard Jenkins) reminding John of what he's left behind or has been running away from, he finds himself increasingly running towards Savannah for two weeks of Spring Break. And fairly quickly, the young couple fall in love and forge a deep connection that continues after they separate and decide to correspond by numbered letters since there's no guarantee what order in which they'll arrive when you're sending overseas. And although – with the benefit of hindsight – that sequence is handled a little too briskly both emotionally and logically as somehow he's able to return home to the U.S. and she can meet him at the airport as if nothing has changed, the lovely thing about Dear John is that it doesn't immediately go in the directions which you assumed it'd be heading. No, in this film life intervenes and they struggle in their commitment to one another so many thousands of miles apart. In addition to the wonderful chemistry between the two leads, John also boasts great subtle turns by both Jenkins and a nice, long overdue quality part for actor Henry Thomas (Legends of the Fall). Although it suffers a few bumps near the end both in the included finale and the DVD's alternate ending which I liked a bit better despite its over-sentimentality, Hallstrom's beautifully realized romance proved to be far more successful than most Sparks adaptations thanks to the intelligent handling of the script by both the filmmaker and its writer Jamie Linden. The equivalent of a wartime message in a bottle with the added bonus of a good luck charm, when Zac Efron’s U.S. Marine Logan finds a beautiful woman’s photograph in the middle of Afghanistan, the words written on the back bidding an unknown soldier to “keep safe” manage to do just that for Logan. The discovery of the photo keeps him occupied and in one place for the few previous seconds that keep him alive during a mortar attack. The first of two near-death experiences that he survives and attributes to his mysterious golden-haired guardian angel, when Logan arrives home he keeps the promise he made to a friend to find the stranger he owes “big time” and thank her any way he can. Tracking her down via the lighthouse in the background of the photo he notices online, Logan walks from Colorado to Louisiana with his dog with the sole intention of simply thanking her. But when he comes face-to-face with the disarmingly pretty Beth (Taylor Schilling), who just so happens to be wearing the same shirt in the photo that she is when she greets him, the tongue-tied Logan lets himself be talked into a job working at her dog motel. Finding himself growing increasingly attracted to the hardworking single mother who constantly finds herself on the losing end of a power struggling with her prominent police officer ex, Logan finds himself putting down roots with the hope of becoming a permanent part of her life. The second tale in addition to Safe Haven to merge romance with the element of danger including a villainous policeman, while Haven employs a stronger mystery thriller element, The Lucky One uses the ex as a minor character and subplot in the otherwise absorbing romantic drama. Though this one boasts far greater character development than the otherwise solid Haven, The Lucky One likewise exceeds expectations thanks to the nuanced portrayals by its core cast including Blythe Danner in a scene-stealing performance as Beth’s grandmother. While by now Sparks seems to have mastered his formulas, swapping out characters and plot details to create endless storylines that deal with his favorite themes, this one marks a terrific war-themed contemporary companion piece to Lasse Hallstrom’s Dear John and also bears a lot in common with Bottle. And in fact, in the succession of John, this production and Safe Haven, we find the three strongest adaptations of his work since Mandoki’s Message in a Bottle. Brought sumptuously to life by Shine writer/director Scott Hicks, who also helmed another contemporary romantic novel favorite turned film with his arthouse adaptation of Snow Falling on Cedars – while this takes a much more mainstream approach than the overly avant-garde yet lushly made Cedars, the end result is a superb feature film. With this in mind, hopefully Lucky will be lucky post-release, only gaining in popularity with time by garnering the same word-of-mouth popularity that The Notebook experienced over the years. And fortunately, thanks to actress Taylor Schilling’s recent breakout success on the Netflix original series Orange is the New Black, things are looking up on that front as more viewers curious to explore her previous portrayals are sure to discover this truly worthwhile film. Oscar nominated My Life As a Dog, The Cider House Rules and The Shipping News filmmaker Lasse Hallstrom returns to direct his second Sparks adaptation following the surprisingly effective Dear John with an even stronger work this time around thanks to Sparks’s new command of the romantic thriller. Blending together the emotional weepie love stories that made him a household name with far more involving, contemporary plotlines that have life or death stakes which go beyond the cruel twists of fate (from cancer to accidents in novels of the past), Sparks has crafted one of his most gripping works that easily lends itself to film. Professional dancer turned actress Julianne Hough shows greater range than ever before as a battered wife who flees her abusive husband and journeys to a sleepy southern town where she starts over in a picturesque seaside community. Once settled, Hough’s Katie slowly builds up the courage to let others in from a friendly new neighbor (played by Cobie Smulders) to Josh Duhamel’s Alex, a widowed shopkeeper and father of two whose adorable youngest daughter takes a special interest in Katie before her father does the same. Unfortunately, while Katie may have found a new place to call home, the man who haunts her dreams has yet to let her go, literally haunting her in real life as well by using his powerful position as a police officer to try and track her down. While this leads to a terrifying if predictably inevitable showdown between the abusive husband and his much-abused wife, Safe Haven has more than a few surprises in store, offering up a few twists as to the truth behind a subplot and character that makes this one vastly more satisfying than a number of other Sparks tales. One of the best film versions of his work so far and one which likewise builds on the strengths of earlier Sparks endeavors from the sophisticated Bottle to the moving ensemble drama Lucky One, Haven finds Nicholas Sparks moving beyond the “final character death” gimmick that plagued his earliest entries by giving us a happier ending than we’re used to seeing on titles with his name attached. A welcome change of pace for Sparks who seems to be growing more ambitious with each new novel, here’s hoping that Safe Haven – much like The Lucky One – will usher in a new decade of excellent Sparks movies that take what worked so well in the last few pictures and plotlines and build from there.